The 18-year-old Canadian singer - whose trademark bouffant quiff has been copied by boys all over the world - spoke to Rollercoaster magazine about the 30-year-old Duke of Cambridge and his lack of locks. 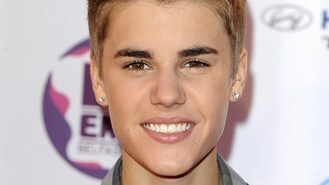 Justin reportedly said: "I mean, there are things to prevent that nowadays, like Propecia. I don't know why he doesn't just get those things, those products ... Have you not got it over here?" The teenage heartthrob - whose latest music video for his song As Long As You Love Me sees him being beaten up by Reservoir Dogs star Michael Madsen, who plays a protective father angry at Justin for dating his daughter - has been speaking his mind a lot lately. Justin has been criticised for a remark he made to Rolling Stone magazine about Canadian Aboriginals. He said: "I'm actually part Indian. I think Inuit or something? I'm enough per cent that in Canada I can get free gas." Now the Congress of Aboriginal Peoples are claiming the comment was racist. A CAP spokeswoman said: "These kinds of remarks promote misconception that we are somehow getting a free ride."